We are offering the most asked Power BI interview questions to help you clear your Power BI job interview. Through this you will learn components of Power BI, DAX in Power BI, PowerPivot, content packs, data refresh, and more. Learn Power BI from Intellipaat Power BI certification training and fast-track your career. 1. Differentiate between Power BI and Tableau? 3. What are the parts of Power BI? Power BI – Power BI is a cloud-based business service. It enables the client to imagine and interpret information with higher rate, and execution. Power Query – It Easily investigates, access, and change public and internal information sources. Power Pivot – It Perform information modelling for in-memory analytics. Power View – It Analyzes and represents data as an interactive data visualization utilizing Power View. Power Map – It helps in Bringing information to existence with interactive visualization. Become Power BI Certified in 16 hrs. 4. Name some of the filters used in Power BI reports. 5. What is Power BI Desktop? Power BI Desktop works well with Power BI service by giving the most advanced data visualization, modeling,and report creation with profoundly interactive visualizations. You can spare your work to a document, and distribute your information and reports ideal to your Power BI site to impart to others. 6. What is your understanding on content packs? Content packs for administrations are pre-developed solutions for popular administrations as a feature of the Power BI experience. An endorser of a supported service can rapidly interface with their account from Power BI and see their data through live dashboards and reports that have been pre-developed for them. 7. What are the types of Data Refresh in Power BI? 8. What are the different components of Power BI? 9. What are benefits of using variables in DAX? Variables can make more unconstrained DAX expressions which are more consistent to interpret.They can’t be shared among queries or be characterized at the model level. When it is declared,the variables can be reused for various circumstances in a DAX expression, in this way staying away from extra queries of the reference or source database. 10. What is Power Pivot? Power Pivot helps in analyzing our data so as to settle on convenient business choices without needing IT support. It empowers us to import large scale of data from numerous data sources into a single Excel sheet. It gives us a chance to make connections between complex data. It helps us to create Pivot Tables and Pivot Charts. 11. What is DAX ? In order to do data analysis on data and for calculation in power pivot, Data Analysis Expression (DAX) is used. 12. What is the default visual interaction in Power BI ? The default visual interaction should be “Drill Mode On”, we can set this to on off, in the event that we keep off, we need to change the setting without fail. Rather set the Default to ‘Drill Mode On’. Drilling Mode on, if the aggregates are at yearly level, the drill mode on can empower client to drill down to month to month, week by week, etc. 13. What is the Difference between Microsoft Business Intelligence tool - Power BI Desktop and Power BI? It is a Windows application (Client) running on the PC. It is a client machine which can be connected with various data sources from your PC to the data in the local PC or the information in the server. Power BI is a cloud solution. We can utilize internet browser to connect with Power BI. We can implement similar advancement work utilizing either Power BI OR Power BI Desktop. 14. What are the connectivity modes available in Power BI? 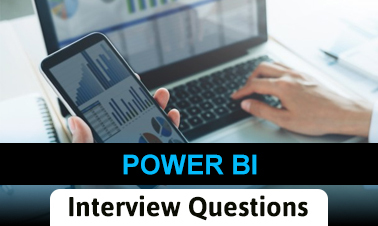 "0 Responses on Top Power BI Interview Questions And Answers"
Sign Up or Login to view the Free Top Power BI Interview Questions And Answers.